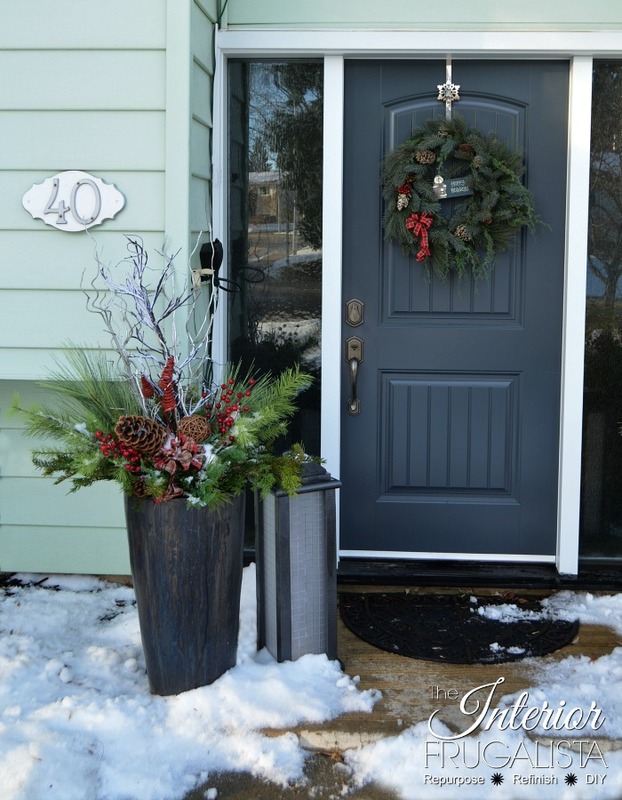 Do you love the look of beautiful Christmas Planters flanking the front door but avoid them at your house because of the maintenance of having to keep them watered? Perhaps you go away for the holidays or you're like me and live in a freeze/thaw environment that wreaks havoc on fresh greens. 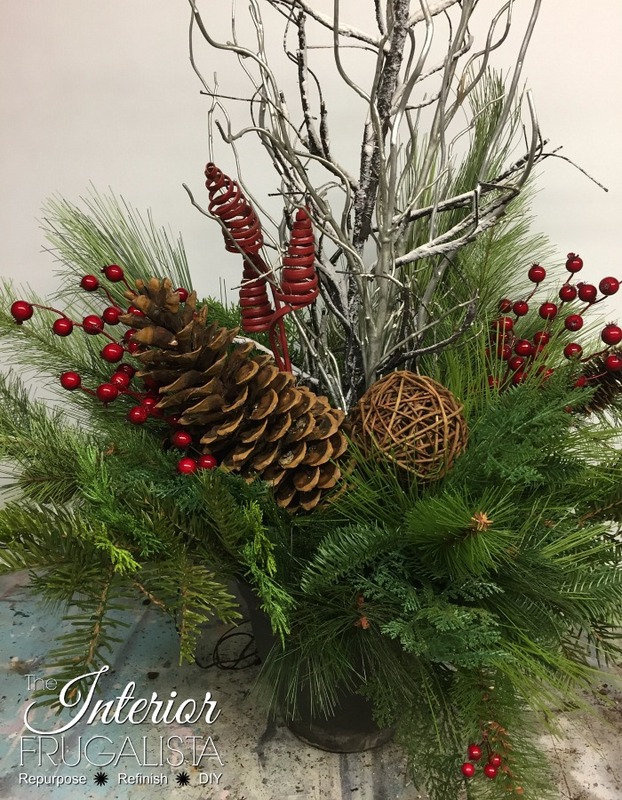 I like having my Christmas urns on display by mid-November, but oftentimes they are dry and turning brown by December 25th. So this year I decided to take a different direction and go the faux route. The investment is much higher initially but they'll pay for themselves within two holiday seasons and I never have to worry about forgetting to water them. 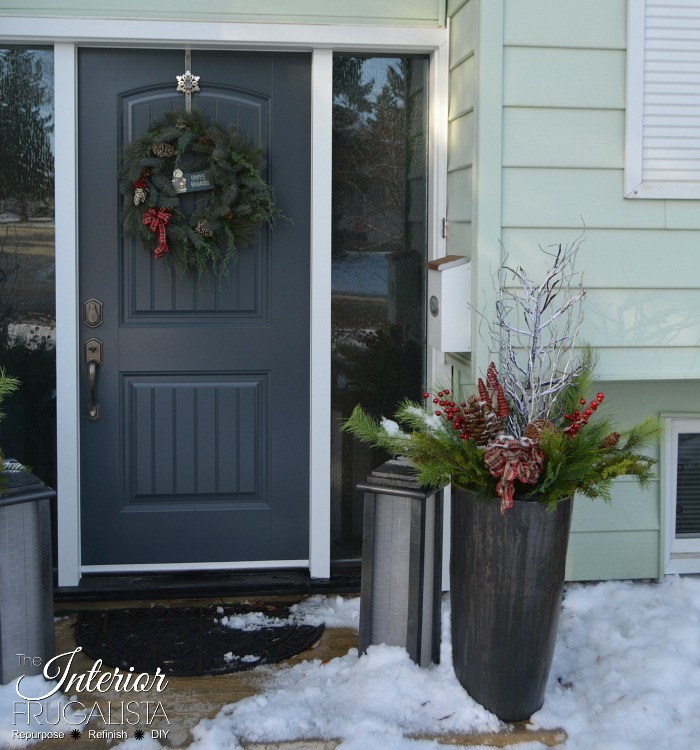 In my post How To Fill Outdoor Planters For The Holidays, I share a tip on how to decorate large heavy outdoor planters from the comfort of inside your home. Towards the bottom of this post, I've included a detailed Materials List for your convenience. 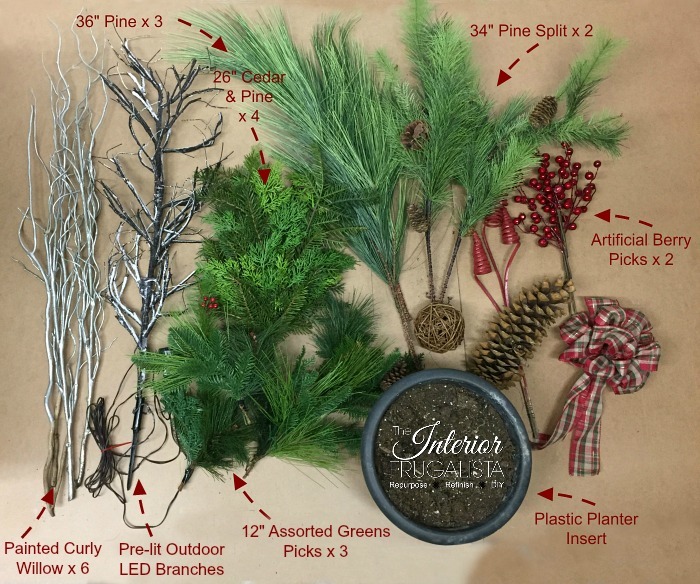 Here is a quick video to show you how all the elements of creating a Christmas Planter came together one by one. Now let's get into the how-to for filling each planter in the order in which each element is added, starting with the prelit willow branches. My prelit willow branches came in a package of three short bundles but I wanted them to be the same height as the curly willow I'd be adding to the center of the pots. To get the height, wire the three bundles together vertically. My suggestion is to save yourself the headache and buy the tall outdoor pre-lit branches. 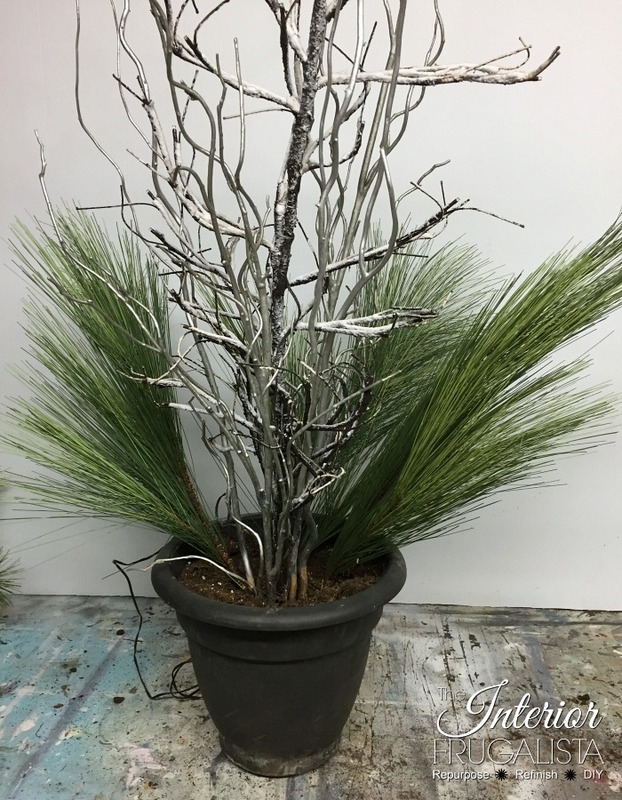 Add six tall painted curly willow branches around the stem of the prelit branch to help support the weight of the pre-lit branch. 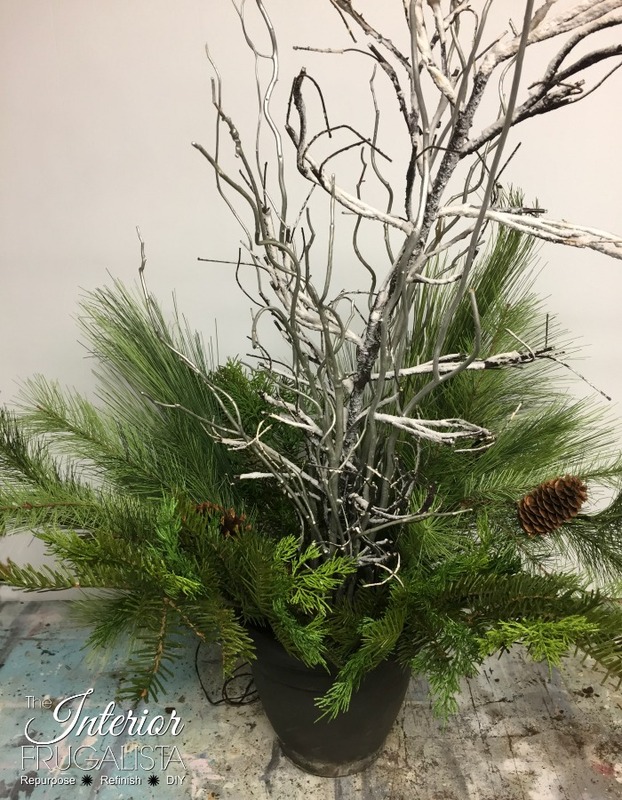 Intertwine the curly willow with the pre-lit, fluffing the pre-lit branches so they look full and illuminate the curly willow. Starting with the longest 36-inch pine spray, add one on each side and one behind the branches, pointing upwards. They will also provide added support to the branches (as pictured below). 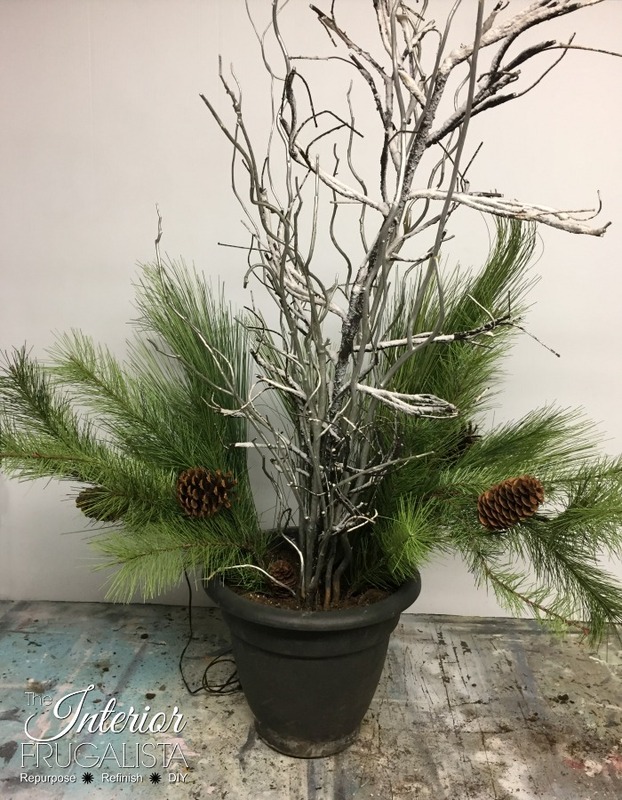 Next, add a bushy 34-inch pine split spray with pinecones on each side, also pointing upwards and bending slighting downwards (as pictured below). Place the 26-inch cedar & pine spray next on either side and on the front and back, pointing towards (as pictured below). Fill in the gaps on the front with three 12-inch mixed green picks (as pictured below). On the left side insert a cluster of three tall red wooden decorative picks (as pictured below). I've had these picks for years and used to stick them in the Christmas Tree. Last year I spray painted them red and wired three together at different heights. I call them my Madonna picks, get it? 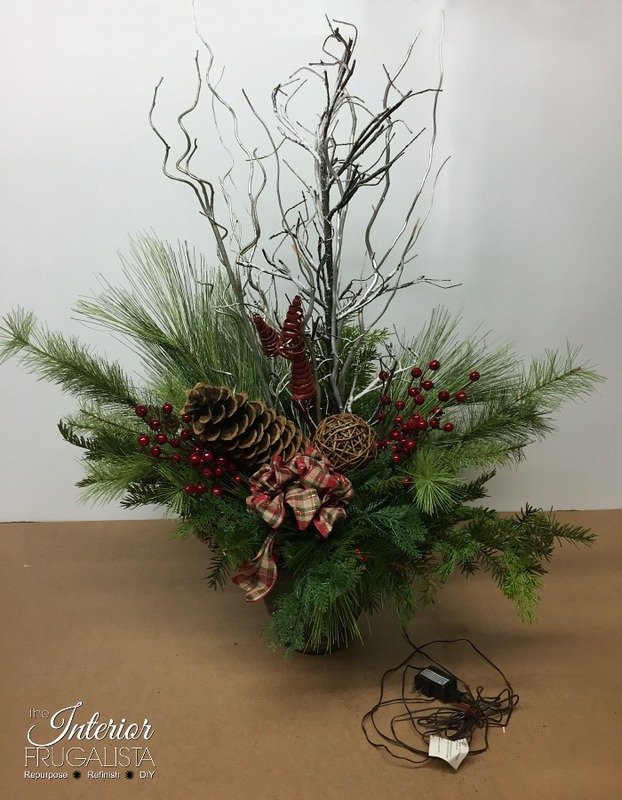 On either side of the tall branches insert a tall artificial berry pick for a pop of red (as pictured below). Wire the large pinecone and grapevine ball and place them in front of the Madonna picks (as pictured below). You can skip this embellishment if you like, and I seriously considered it. Wire a plaid bow in front of the pinecone and grapevine ball (as pictured below). If the planters are quite full, a smaller bow would work just as well. Roll out a strand of ribbon 6-inches long (first tail). Measure a strand of ribbon 8-inches long over the previous strand. Measure another strand of ribbon 8-inches long over the previous strand. Repeat the last two steps until you have 8 stacked loops. Measure a strand of ribbon 2-inches long over the last strand (center loop). Measure one last strand 6-inches long (second tail). Tie the ribbon with a 16-inch piece of florist wire in the center. You should now have eight 4-inch loops on either side. Fan open the loops and fluff each loop open. 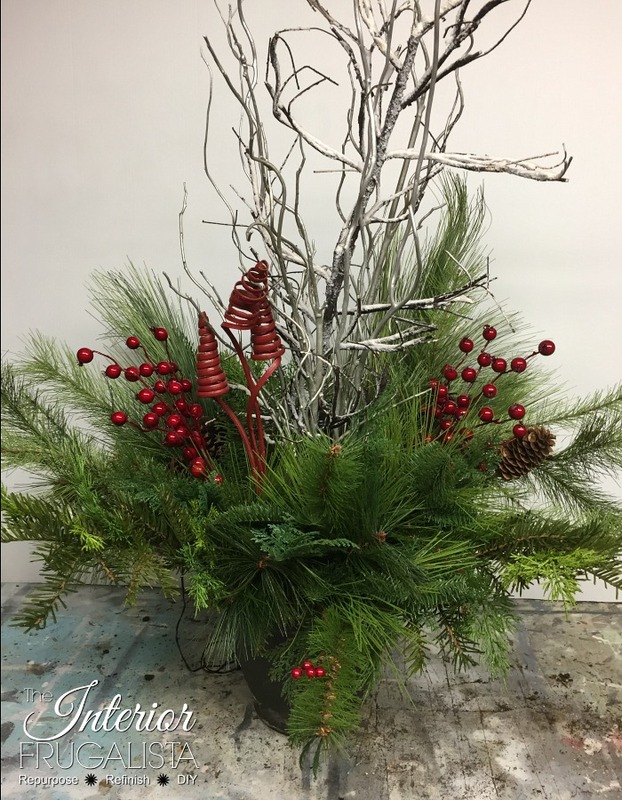 Place the 2-inch loop over the florist wire to conceal. Cut the ends of the tails. Long strands of florist wire used to attach the bow to Christmas Planter greens. 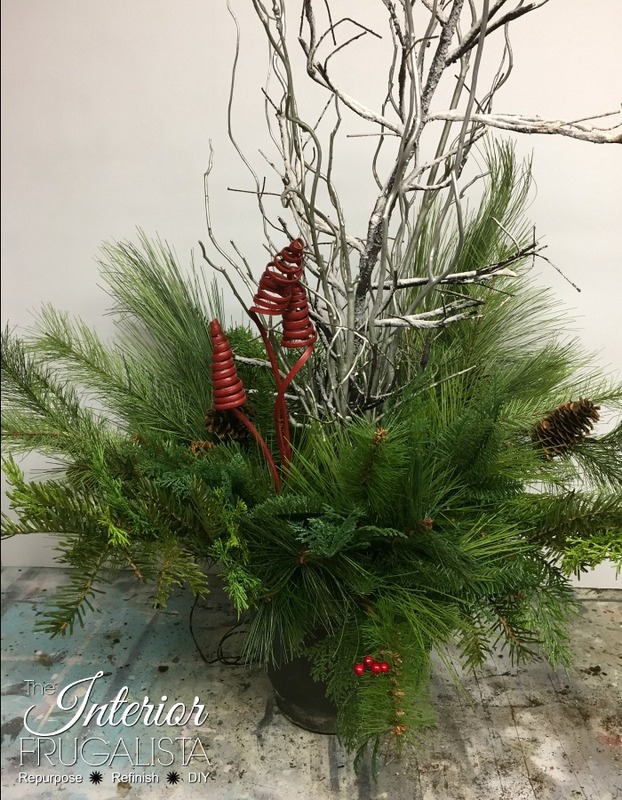 Place decorated plastic inserts into your tall planters, admire your work and forget about them until after the holidays! 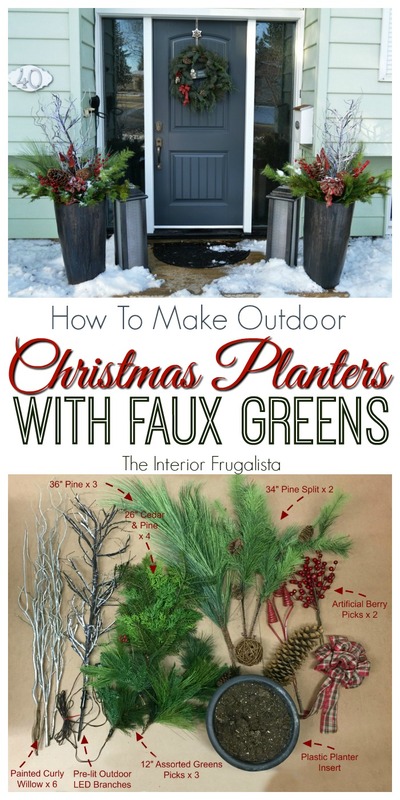 Now, this sounds counter-intuitive but I watered the faux greens in like you would fresh greens to freeze them in. This step isn't necessary but my planters are out in the open where there is a bit of a wind tunnel so this is extra security to prevent the smaller embellishments from flying off with the wind. 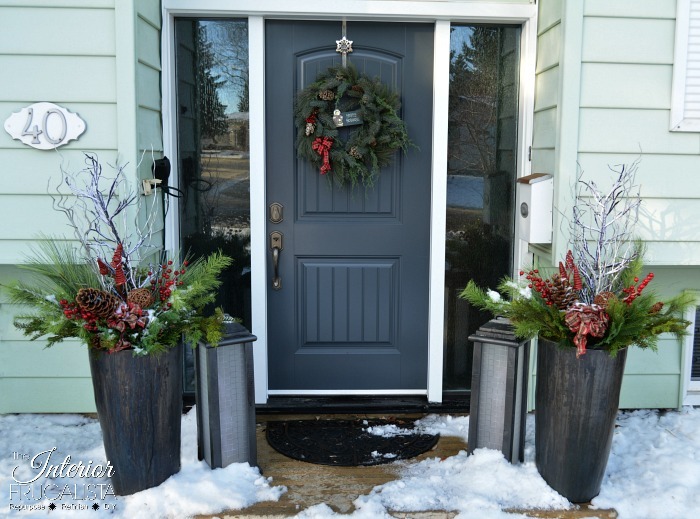 Here are my Christmas Planters in our tall heavy plant pots flanking the front door. ...and this is what they look like at night illuminated by the pre-lit branches. For a couple of years, we had tall lanterns with mixed greens on top of each planter but I missed having traditional Christmas Urns. 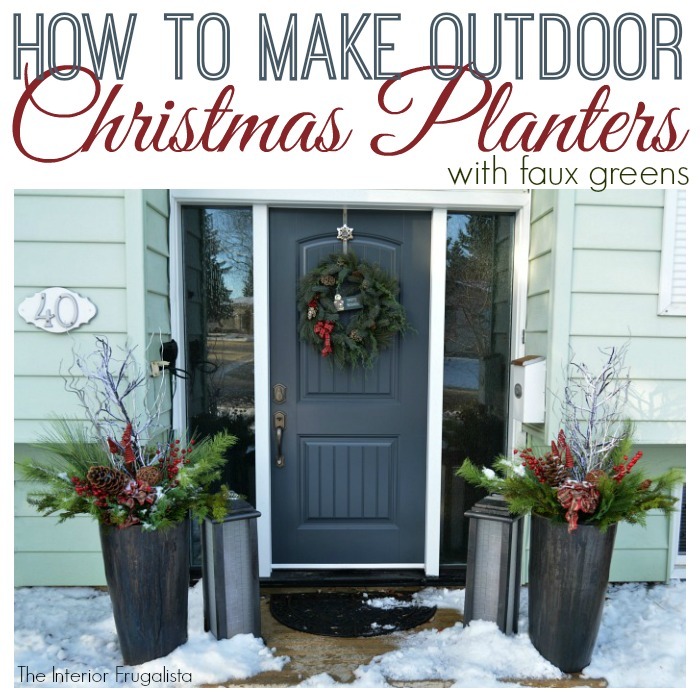 I like the idea of having both the holiday planters and lanterns to welcome guests during the holidays. The lanterns we made from salvaged scraps for a fraction of the cost of buying large lanterns. 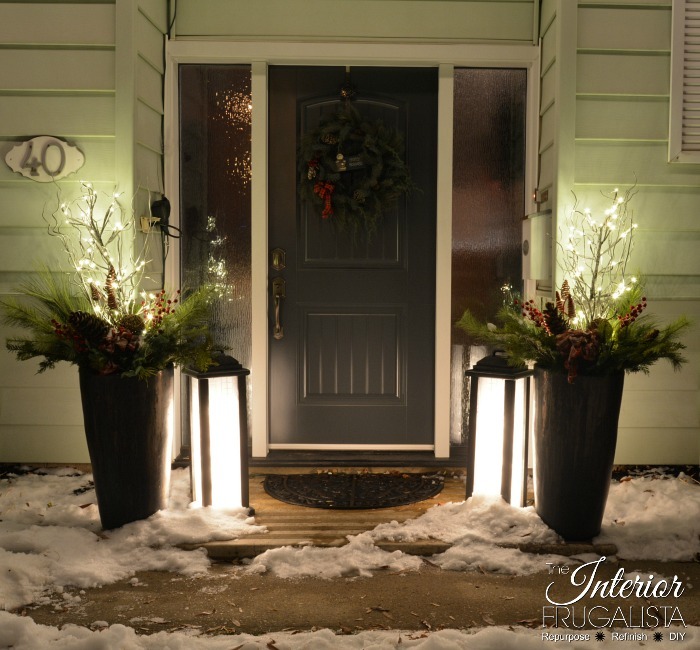 You can see how we made them here in the post, Large DIY Holiday Lanterns. 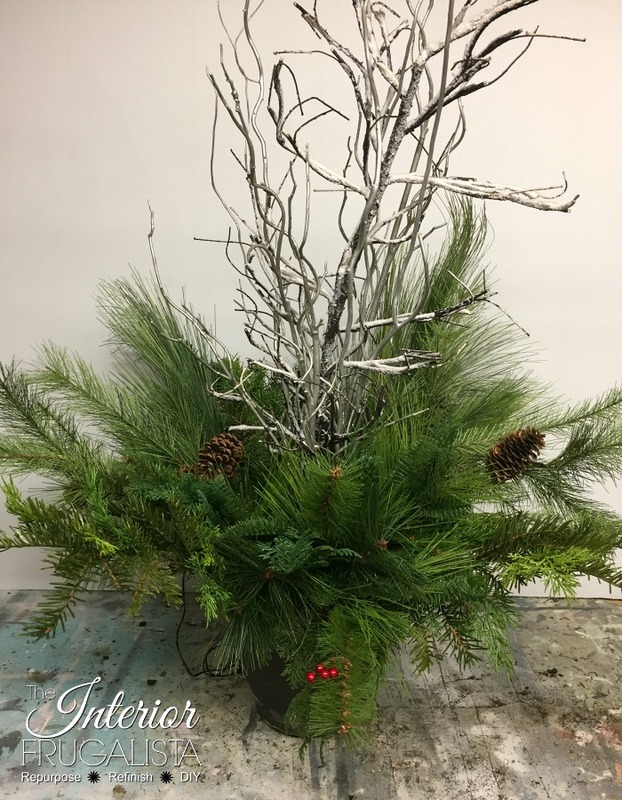 3 Long Pine Spray 36"
2 Pine Split Spray with Pinecones 34"
3 Mixed Green Picks 12"
The total cost to make these Christmas Planters with artificial greens was approximately $150 per pot. I just heard you gasp but if you compare the cost of using fresh greens every year, these will have paid for themselves within 2-3 holiday seasons. You could easily spend this amount per pot every year if you had them made by your local greenhouse or flower shop. For those of you, like me, with black thumbs who prefer the fill and forget option for Christmas Planters, save it on Pinterest to refer back to and/or share it with a friend. If you purchase good quality artificial greens, it is hard to tell they aren't the real thing unless you touch them.